MINI is relaunching the John Cooper Works hot hatch and convertible in January 2019, with higher spec and some important technical updates. Prices are to be confirmed, but expect the range to start at around £24,500 - about the same as the old model. 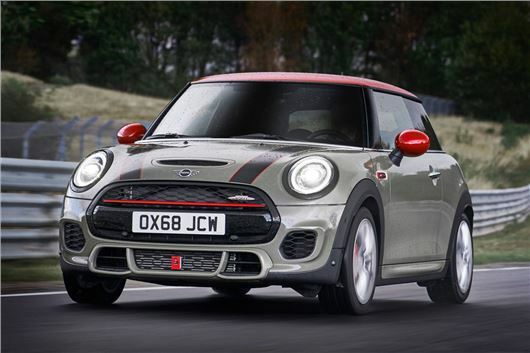 Both the MINI John Cooper Works hot hatch and convertible cars were taken off sale in 2018, as they didn't meet standards set by new WLTP fuel economy tests. The biggest change for the relaunched models is one you won't notice - a petrol particulate filter integrated into the exhaust system in a bid to reduce emissions and make sure the JCW meets the latest Euro 6d emission standards. Don't worry, though - MINI says the standard sports exhaust still makes a characterful sound. Powered by a 2.0-litre turbocharged petrol engine producing the same 231PS as before, the MINI JCW Hatch will reach 62mph in 6.3 seconds when combined with the six-speed manual gearbox. The Convertible takes 6.6 seconds, while an eight-speed Steptronic automatic gearbox is also available - although performance figures for this are yet to be confirmed. Officially, the Hatch will return 40.9mpg with the manual gearbox and between 45.6 and 46.3mpg with the automatic transmission. The Convertible, meanwhile, returns between 39.8 and 40.4mpg with the manual gearbox and 43.5 to 44.1mpg with the auto. Cosmetic upgrades for 2019 include new 17-inch black Track Spoke alloy wheels as part of the standard spec, as well as Dinamica leather JCW bucket seats and Piano Black interior and exterior trim. Sports suspension is also standard, as is a John Cooper Works aerodynamic body kit. Orders for the new JCW Hatch and Convertible will open on 18 January with deliveries from March 2019.